The genetic basis of an erectoid leaf phenotype was investigated in distinct tomato breeding populations, including one derived from Solanum lycopersicum ‘LT05’ (with the erectoid leaf phenotype and uniform ripening, genotype uu) × S. pimpinellifollium ‘TO-937’ (with the wild-type leaf phenotype and green fruit shoulder, genotype UU). The erectoid leaf phenotype was inherited as a semi-dominant trait and it co-segregated with the u allele of gene SlGLK2 (Solyc10g008160). This genomic location coincides with a previously described semi-dominant mutation named as Erectoid leaf (Erl). The genomes of ‘LT05’, ‘TO-937’, and three other unrelated accessions (with the wild-type Erl+ allele) were resequenced with the aim of identifying candidate genes. 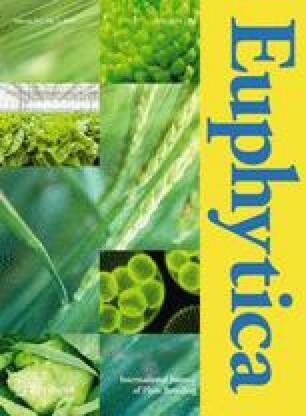 Comparative genomic analyses, including the reference genome ‘Heinz 1706’ (Erl+ allele), identified an Erectoid leaf-specific single nucleotide polymorphism (SNP) in the gene Solyc10g009320. This SNP caused a change of a glutamine codon (present in all the wild-type genomes) to a TAA (= ochre stop-codon) in the Erl allele, resulting in a smaller version of the predicted mutant protein (221 vs. 279 amino acids). Solyc10g009320, previously annotated as an ‘unknown protein’, was identified as a TILLER ANGLE CONTROL1-like gene. Linkage between the Erl and Solyc10g009320 was confirmed via Sanger sequencing of the PCR amplicons of the two variant alleles. No recombinants were detected in 265 F2 individuals. Contrasting S7 near-isogenic lines were also homozygous for each of the alternate alleles, reinforcing Solyc10g009320 as a strong Erl candidate gene and opening the possibility for fine-tuning manipulation of tomato architecture in breeding programs. The online version of this article ( https://doi.org/10.1007/s10681-019-2418-1) contains supplementary material, which is available to authorized users. This work was done in the context of MG-A doctoral studies program at the Facultad de Agronomía, Universidad de la República Oriental del Uruguay. We thank A. Manzzioni, I. Laxague and N. Zunini of INIA Salto Grande, and W. P. Dutra and A. F. Costa of Embrapa Vegetable Crops, for their assistance in conducting some of the experiments. LSB and MENF were supported by CNPq and CAPES grants. AJT and FM were supported by BBSRC Research Grant BB/L011611/1.